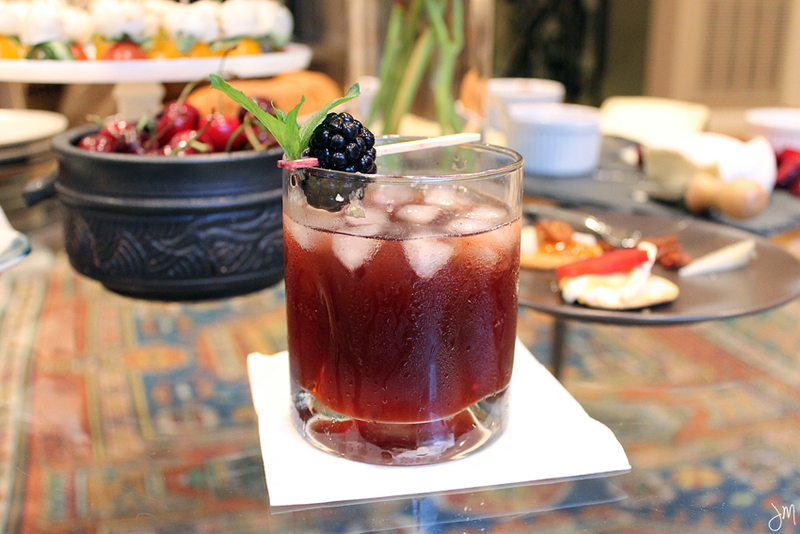 Today, I'm thrilled to share with you this Blackberry Ginger Shrub Old Fashioned recipe, which was inspired by a recent tasting I did at Range as part of a collaboration with the new and improved Chevy Chase Pavilion. The collaboration involved the creation of two cocktails inspired by the ingredients and techniques I witnesses and tasted at Range. 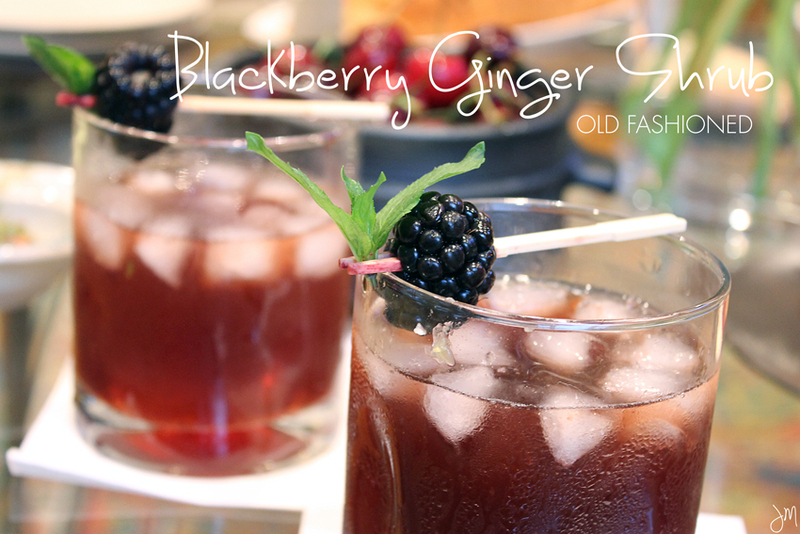 You can find the recipe for the Blackberry Ginger Shrub Old Fashioned below and the second cocktail along with some entertaining tips using my favorite World Market products here. After spending a few hours at Range sipping on cocktails, nibbling on snacks, and chatting with the bartenders, I was struck by two main concepts: experimenting with technique and flavor and a respect for seasonal flavors. To me this cocktail fits with both of those themes because although I have tasted shrubs before, I've never tried my hand at making one (they are surprisingly easy to make) and who doesn't love fresh blackberries in the summer? The result is a refreshing, tart and sweet take on an Old Fashioned. 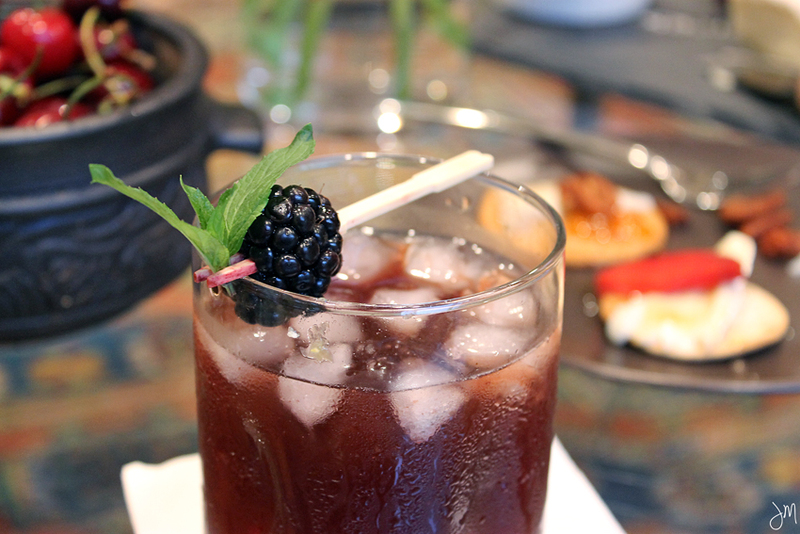 To make the blackberry ginger shrub, mix the fresh blackberries, ginger, and sugar in a large bowl. Mash with spoon to increase the release of juice. Let sit for a day in the refrigerator. Strain the solids and press lightly on the fruits to expel any remaining juice. Mix the juice with the vinegar and whisk to combine. Place the mixture in a mason jar to store. If sugar and vinegar separate, shake well to combine. For the Old Fashioned, add the bitters and shrub to the bottom of an old fashioned glass and stir with a bar spoon. Add ice to the glass. Top with bourbon and a dash of club soda. Garnish with a blackberry and enjoy! 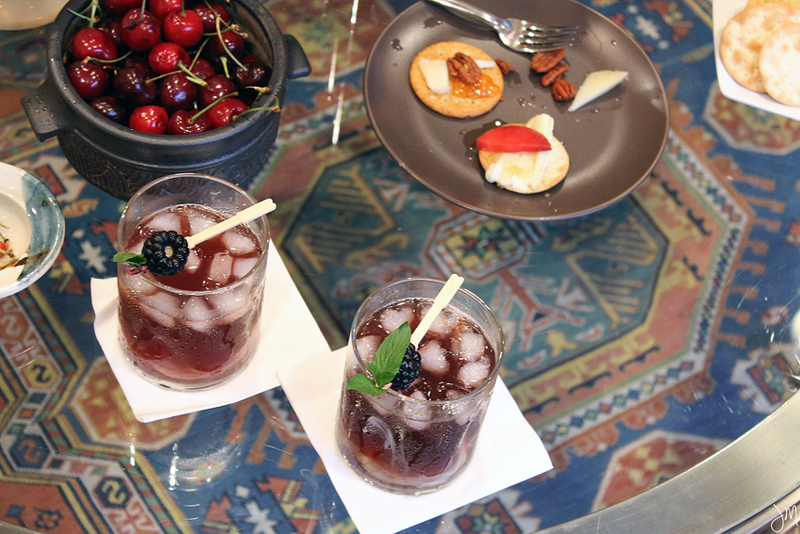 Head on over to the Chevy Chase Pavilion page where they are sharing the other cocktail I created and some of my favorite World Market products along with helpful cocktail party entertaining tips. Full disclosure: This is a sponsored post. However, all of my opinions regarding Chevy Chase Pavilion, Range, and World Market are my own. Range is one of my new favorite DC restaurants and World Market products are staples in my home for entertaining! 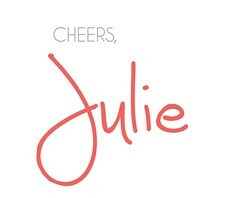 Yum Julie! I'm going to have to try this! The old fashioned is one of my absolute favorite cocktails -- you go and add blackberries and ginger and you've literally found the way to my heart, love this collaboration!! in the article, thanks for awesome share. I will be happy to your work with all your life. I have shared many wonderful, insightful and awesome news rio 2016 olympic live stream here. for those codes and steam wallet gift cards online from the generators at http://free-steamwalletcodes.com free. this webpage can let you know how to hack a fb account online here at no cost.So wait no longer and get access to this link. Add the bitters and shrub to the bottom of an old fashioned glass and stir with a bar spoon and it will be great. We provide essay writing service and cheap custom essay online service offers you the best writing experience. i have seen your article i love this article really i like it . شركة كشف تسربات المياه بالاحساء ونحن نقوم بغلق شبكة المياه الرئيسية وجميع الحنفيات في المنزل ثم نقوم بضغط خط الانابيب الحار والبارد بغاز النيتروجين وهو يعمل علي ضغط الانابيب بحيث اذا وجد كسر صغير جدا في خط الانابيب الحار او البارد يسبب اهتزاز او صوت ولا يمكن ان تسمع الأذن البشرية هذا الصوت ويتم سماع هذا الصوت من قبل الجهاز الالكتروني مع خبرة الفني المتخصص في كشف التسربات يمكن ان يميز بين ضجيج وتسربات ونقوم بالمشي بجانب جدار الحمام وجميع الحنفيات والاماكن التي تخرج منها المياه. والمياه المندفع في الأنابيب ايضا في منطقة التسربات تسبب اهتزاز في الانابيب وتنتقل هذه الاهتزازات من خلال الانابيب إلى سطح الأرض حيث تعبر عن نفسها من الضوضاء الجهاز الالكتروني وظيفة المبتكرة المرشح الأمثل يجعل من الأسهل التحديد بدقة عالية مكان تسرب المياه حيث الجهاز قادر علي تتبع الصوت في الانابيب ويقوم بتحديد اعلي منطقة لخروج الصوت في خط الانابيب وغالبا تكون هي منطقة الخراب في الانبوب بنسبة 99%. ويفضل العزل المائي في بعض الحالات على الرغم من اصلاح التسرب ولكن عزل مائي يحمي المنزل من تسربات المياه في المستقبل. في الماضي كان من الخطأ عدم الكشف من خلال الجهاز الالكتروني حيث اذا سقط شيء على الأرض كان يصعب عليك تحديد صوت التسربات من الضجيج . هذا هو شيء من الماضي اما الآن بفضل الله ثم التكنولوجيا الحديثة يتم رصد مستمر لأشارة الصوت في الانابيب ويمكن تحديد نقطة التسرب بسهولة. Chandigarh escorts We offer hot and sizzling for ultimate pleasure and physical satisfaction. Call us and enjoy intimacy. We are one well known and of the Chandigarh escorts that are skilled. 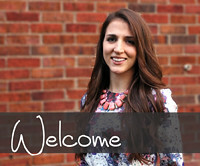 We are dependable and dedicated program supplying vibrant personal and intriguing plus much more. We need there to someone to assist higher charm anybody and your individual specifications if you understand your requirements and should be unhappy. I love this kind of blogs.This page collects lots of comments. But how many of those comments are not related to the topic.I try my best to share topic related information to everyone. You can also know many topic by example : best tv shows, educational program, top sports, adventurous wild life, best movies, science-fictions activity,super models fashion shows.